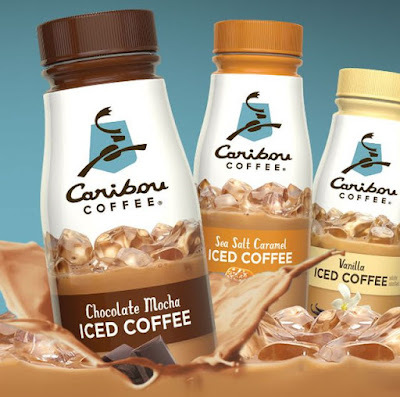 Caribou Coffee makes a move against Starbucks bottled Frappuccino line with the nationwide introduction of new ready-to-drink, bottled Caribou Premium Iced Coffee. The new coffee drinks are available in three flavors: Chocolate Mocha, Vanilla, and Sea Salt Caramel. There's seems to be a little bit of one-up-man-ship going on as Caribou's Chocolate Mocha lists chocolate (in addition to cocoa) among its ingredients, while Starbucks' Mocha Frappuccino only includes cocoa for its chocolaty flavor. Caribou Premium Iced Coffee can be found in the dairy case at grocery and convenience stores nationwide as well as at Caribou coffee shops. They come in 14-oz single-serve and 32-ounce multi-serve bottles with a suggested price of $2.99 and $3.49, respectively. It should be noted that neither Caribou nor Starbucks produce their respective bottled coffee drinks directly. The new Caribou Iced Coffees are produced and distributed by Dean Foods Company, while Starbucks bottled drinks are produced and distributed by a partnership between a subsidiary of Starbucks and Pepsi-Cola North America (generically, but descriptively, named the "North American Coffee Partnership").